The state of Rajasthan is home to many fascinating traditions which date back to several hundred years. The state is well known for its beautiful palaces, forts, the Thar Desert and much more. While Jaipur, Udaipur, etc. are some of the most often visited places in the state, the land of havelis and maharanas has much more to offer than the above-mentioned cities. The majestic Mehrangarh, the shimmering lake of Pichola and the radiant Amber Fort are all worth the hype, but if you get away from the tourist circuit in the desert state of India, you would be able to discover quite a lot of unexpected getaways in India's most energetic state. Do you want to escape from the crowd? Then head to one of these lesser known gems in the state of Rajasthan. Known as the Gateway to Ranthambore, Sawai Madhopur is a beautiful and an ancient city in the state which is surrounded by Vindhyas and the Aravalis. The place is an ideal spot for the adventure enthusiasts amongst us. The Ranthambore Fort, Sunheri Kothi, Jama Masjid and the Khandar Fort are major attractions here apart from yummy guavas. This beautiful state is filled with quiet corners and unknown attractions if you know the right place to look for; one such place is Nagaur. The city is home to the Sambhar Lake, which is the largest salt lake in the country. The city also finds its name in the Mahabharata; the city was known as Jangladesh then and till date has been keeping its rich cultural heritage, values and traditions alive. Nagaur is home to the dargah of the famous Sufi saint Hamiduddin Chisti Faruqui Nagauri who was one of the chief disciples of Khwaja Moinuddin. The small town of Jhalawar is relatively a newbie when it comes to being a part of the travel circuit. A distinctive feature of this place is unlike other cities of Rajasthan, here one would come across a water filled green and grassy landscape. The place gets its name from Jhala Zalim Singh and is home to a very diverse cultural heritage which includes many forts and palaces which date back to the Rajput and Mughal periods. When here visit the Buddhist caves and stupas in Kolvi village, Jhalawar Fort, Bhawani Natyashala, Gagron Fort, Sun Temple and Shantinath Jain Temple. The town of Kuchaman holds an important place in the state of Rajasthan. Located at a distance of 100 km from the well known town of Pushkar, the city is home to an impressive fort which has been converted to a heritage hotel. The scenery surrounding the fort is breathtaking with its blue sky and unlike the other cities where pollution has made its mark, here the area is totally pollution free. The fort has a very rich collection of original inlay work with semi precious stones, glass and gold paint. 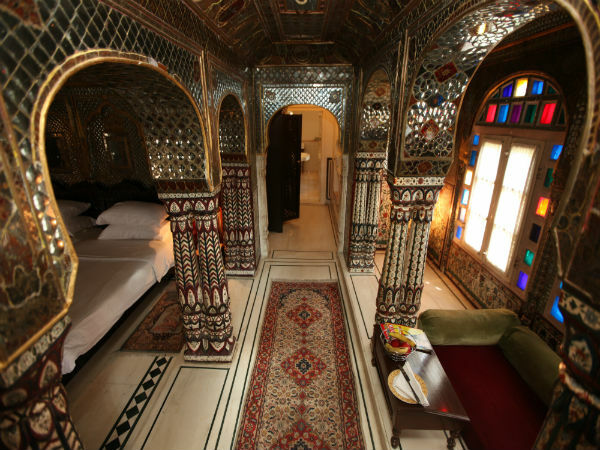 The Sheesh Mahal within it is truly a sight of beauty. The Meera Mahal is another palace in the city which represents the life of poet saint Meerabai. The stories displayed on the palace walls with rare paintings help you understand her life and times. Bounded by the state of Gujarat in the east and located at the foothills of the Aravalli Hills, Dungarpur is an eye catching sight, equal to the beautiful green marble found here. The rare architecture of the palaces and royal residences here offers you a sight which cannot be found anywhere else. The stone structures are carved with jharokhas and are built in a style which had emerged during the reign of Maharawal Shiv Singh in the 18th century AD. Well known for its rich crafts which include wood carving, pottery, embroidery work and ajrak prints, the town of Barmer is located at a distance of 153 km from Jaisalmer in western Rajasthan. Earlier known as Mallani, it was later renamed as Barmer by Bahada Rao who was also known as Bar Rao. The town captures the mind of every individual who comes to visit here and has stood the test of time. Dotted with blue houses, lakes, hills, bazaars and temples at every turn, Bundi is a place which is straight out of a fairy tale. It said that Rudyard Kipling wrote a part of his famous novel Kim here and he describes the Bundi Palace as a structure which men had built for themselves in uneasy dreams and is the work of goblins rather than of men.